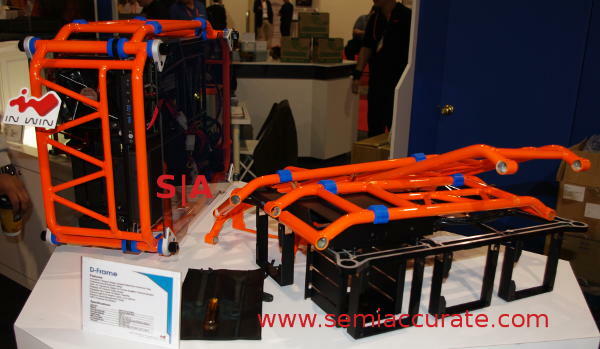 Inwin stepped up their CES presence in 2013 with a booth near the front of one of the halls, and SemiAccurate is glad they did. There were two things that really stopped us in our tracks, and a handful more that were worthy of praise too. The first is a case called the D-Frame, the second in the limited edition Frame series. D-Frame is based on the concept behind a motorcycle frame, and it shows. The case is hand made from thick aluminum tubes, hand welded, and either quite fetching or quite hideous to most observers. The choice of day glow orange or bright red paint doesn’t help with the polarizing aspects, but most seemed to like the thick glass side panel. They should start shipping within the next few weeks, production is limited by the time it takes to make them, only a few a day come out of the factory. A D-Frame will set you back $399, but given the high quality of the parts, that isn’t bad. If you disagree, go look at custom bike parts for a sobering realignment of your value system. Each case is shipped as a flat pack, and comes with a little toolkit containing everything you need to build it. It looks like a lot of fun, and should outlast your PC, your car, and probably the PC industry. 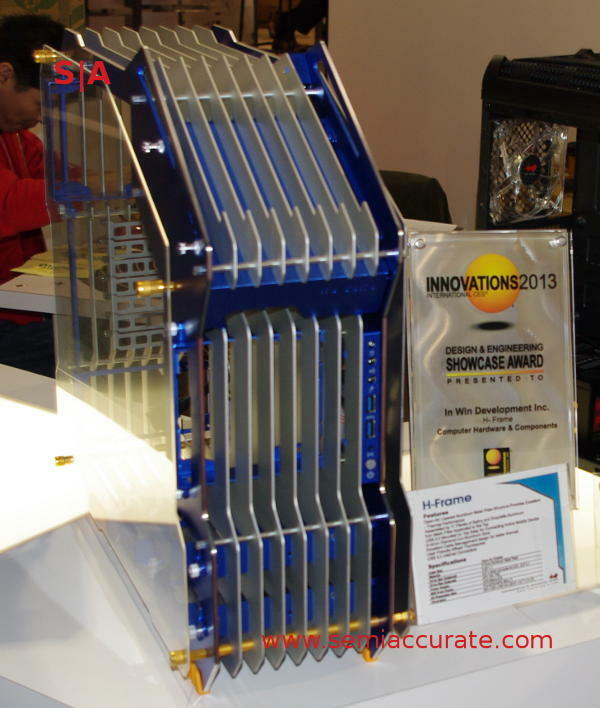 One case that we missed at Computex last summer was the H-Frame, the older brother to the D-Frame. It is also a $399 limited edition model, and one that also polarizes opinion. Once again, the author likes it a lot, his wife dislikes both -Frames, something about dust catchers she said. Since she will be reading this, we won’t pass judgement. Did I mention that I like it? The next item is not exactly a showstopper, just a really handy little device called the APS. It looks like a 5.25″ DVD drive, and fits in the bays made for them that don’t do much good any more. APS has two USB ports in front and two 6+2 PEG cables in back. APS is a 450W PSU that you can add to a system to push more juice to a new GPU, and it is an easy add to a vanilla PC without enough connectors. The nicest part is the two 2A always on USB charging ports in front, quite useful if you have a tablet.